You Craft Me Up! 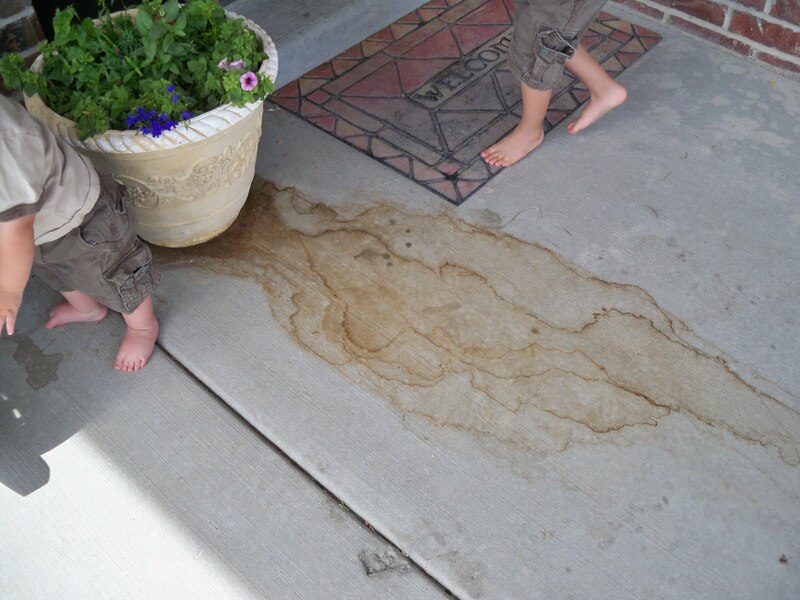 : Stained Concrete? 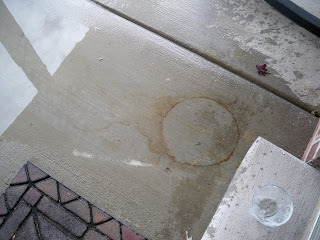 I don't know if any of you are like me, but my pots tend to "pee" all over my concrete and stain it. In the past I just wait, and eventually, (like two years later!) it fades away - kinda! So as I was blog surfing the other day I saw a link on Someday Crafts for homemade BLEACH SCRUB, from the Homemade Mammas blog. I started thinking, "Hmmmmm...I wonder if that would work on my concrete?" Well, see for yourself! 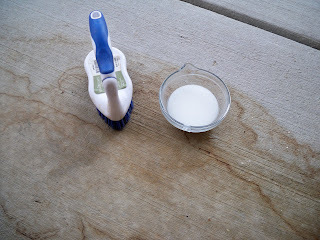 To make the bleach scrub, use two parts baking soda, to one part bleach. I used 4 Tbsp baking soda, and 2 Tbsp bleach. 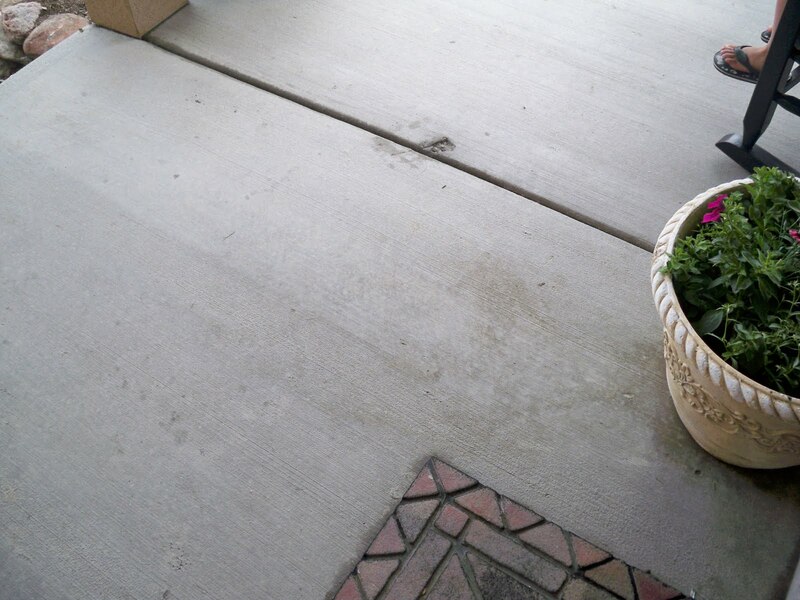 I also used one of those scrubby brushes to scrub the concrete. I did have to repeat if a few times, especially where the base of the pot was, but eventually it came mostly off (there is still a really faint ring from the pot.) But look how good it looks! Go HERE to see the Homemade Mammas post. Thanks ladies for the tip! Hi, I just found your blog and it is so full of great ideas! Thanks for fharing them. I love the idea of having a candlestick craft night! And your FHE tags are a great too. But my favorite has to be your desk!!! Again thanks for sharing and I am now a follower. Me again... that is "sharing" not "fharing"... that is what happens when I get typing so fast because I have found a great blog! Wow... Dont even remember how I got here because I opened so many blogs at once, and then ready them one by one.. ;) I LOVE your little blog here! You ahve so many great ideas!! Between this, your kitchen aid makeover and your desk re-vamp... OH MY!! :P I'm totally following you! OK, that's it. I think I need to follow your blog. You're going in my sidebar. Which never happens until I've read a blog for some time. You have some style going on here girl. I need to surround myself with it. I'm enjoying your blog this morning! I wanted to tell you that Bar Keepers' Friend will scrub up concrete and masonry tile, I've used it with great results even on rust stains.